REFRESH THE PAGE AT EACH VISIT, IT CHANGES OFTEN!! Many PEN BLANKS ON CLEARANCE---go to pen blanks page! We sell defective pieces as clearance items at greatly reduced prices. These are the same pieces most catalog sellers will sell you as normal stock! That is why we need a clearance page, integrity and honesty require it! 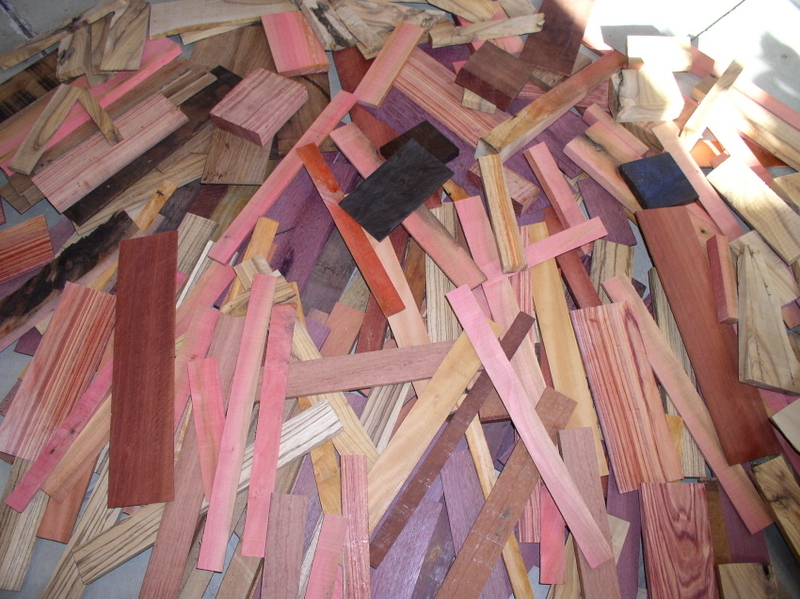 Many types of wood in each box (99% exotics and maybe a few high figured domestics), these are great for inlay or small projects---sold below cost and will not be labeled as to type. They are NOT suitable for exacting projects like gun grips or making duck calls unless you are going to laminate multiple pieces together. These are small pieces, we don't put into scraps anything that is big enough for us to make a perfect pen blank. They work well for wooden jewelry box inlays or other small projects. Random and won't be selected by requests and as scraps, will obviously have some defects . FREE SHIPPING If you checkout on the web site and pick "scraps only" as your shipping choice, unless you are buying other items. If you pick another shipping choice, the amount shown in the cart will be applied and will be your shipping fee. Scraps sent "scraps only" are sent by our choice of carrier/service and may be sent seperately or together with the rest of your order. Remember: If there is anything else in your order, do not pick "scraps only" for shipping. THIS IS AN INTERNET SPECIAL ONLY. USA ORDERS ONLY, THANK YOU. If you have any questions about scraps, send us an email rather then calling. We sell these below our cost and need to minimize time spent discussing them---thank you. Important Note: We have repeatedly experienced the following over the years (over 10 years) of some> of the larger catalog sellers in the USA : 1)They sell very wet blanks (ok since they usually tell you that) 2)They sell blanks with defects but don't mark them as such 3) We have recently verified in one case that every single piece of a certain size is checked and being sold without the customers awareness until it arrives. 4) At least one blocks negative reviews so you cannot find out which blanks have problems. 5) Heavy wax is used, supposedly to protect the blanks, but it also makes it so you cannot see the real defects until you have removed the wax and voided your chance to return the piece (we do special inspections of waxed wood to prevent this). 6) They won't select blanks for you, and the customer service is almost always someone who knows little/nothing about wood. 7) In the rare case when we have been able to get non-defective wood selected, it was considered a major effort for them and something that was out of the ordinary and required them to step out of the norm (that has only been begrudgingly offered once to us in 10 years---still we got 10% percent defective pieces anyway.) These tests have been expensive for us, but have yielded consistent results over time. We tell you the facts of what you are getting, as well as giving a hefty discount when offering slightly defective wood or waxed wood with possible defects , they don't . We also don't do any of the 7 things listed above, and that costs us over 50% of the profit we could get if we did those 7 things (we cull lots of wood due to defects and cut them to smaller perfect sizes and carefully inspect even waxed pieces). There is a huge difference in quality and price (once you remove defects) between us and them. We don't claim that everyone has our experience, but through many large trial orders over the years to test them, this has been our consistent experience over many orders for many years. We believe in honesty and integrity, and we hope you'll vote with your dollars to help us maintain this quality.